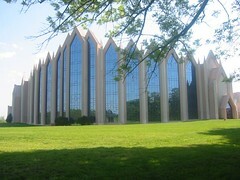 This church called ‘Calvary’ is beautiful, imposing, functional and BIG. It stands on US highway 51, the junction of Pine-Matthews & Rae Road. It includes playing fields (soccer, sand-pit, climbing frames etc), cemetery, book-store, chapels, security guards, cafe, massive car parks, and probably much more than a visitor like me can find in 30 mintues! This scribble was published on Thursday, April 21st, 2005. You can follow any banter on this scribble with the RSS 2.0 feed. You can share your inspired musings after typing the anti spam word near the bottom of the page. But no Pinging because its too naughty.